Julie's Crafty Space: Been to see Santa! I've been neglecting my blog for the last week as I've been quite poorly with the lupus. I'm starting to feel a bit better now, so I thought I'd put a nice, happy post to remind everyone how close we are to Christmas! 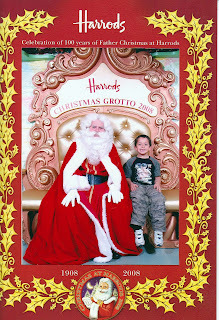 I took my son to Harrods last week to see Santa. You have to book now, and by the time I got round to it there weren't many dates left. We went with a friend of mine and her 8 year old son, and the kids had a lovely day (so did the mums in the handbag department of Harrods). We went to the Natural History Museum first to see the dinosaurs. They've certainly got it all worked out there, as when you come out of the dinosaur part, it leads you straight into the shop. So, £10 lighter off we went to Harrods. First visit - the handbag department-and a lovely Marc Jacobs bag for mum. Then onto Santa. I expected to see a lot of people around, but we went straight in - a good start. Santa was very chatty and when he asked the boys if they'd been naughty, my son's hand went straight in the air, but he did promise Santa he'd be good now (haha). They were given a huge chocolate coin, a badge (mums got badges too) and a Christmas sticker book, all free. We did buy a photo, which was a lovely reminder of the day. My son's 7 now, so I'm hoping we'll be able to go again next year. A lovely photo, as you will know with having an older child enjoy these last few Christmases with all the excitment of santa coming. Sorry to hear you have not been well, remember to indulge yourself wherever possible and that laughter is a wonderful healer if only for the time you laugh.